Focus mode and full screen mode are two different ways to see more detail in your visuals, reports, and dashboards. The main difference is that full screen removes all the panes surrounding your content while focus mode allows you to still interact with your visuals. Let's take a closer look at the similarities and differences. What is full screen mode? 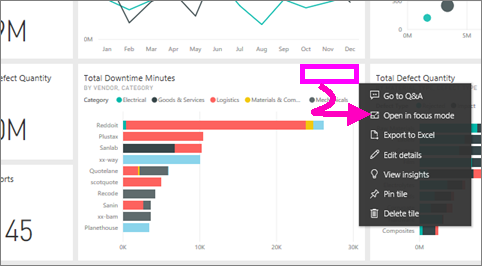 Display your Power BI service content (dashboards, report pages, tiles, and visualizations) without the distraction of menus and navigation bars. You get an unadulterated, full view of your content at a glance, all the time. This is sometimes referred to as TV mode. 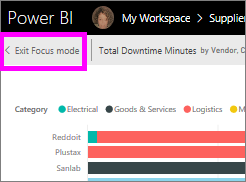 To open full screen mode, select the full screen icon from the Power BI service menu bar above your dashboard, report, tile in focus mode, or visual in focus mode. Your selected content fills the entire screen. 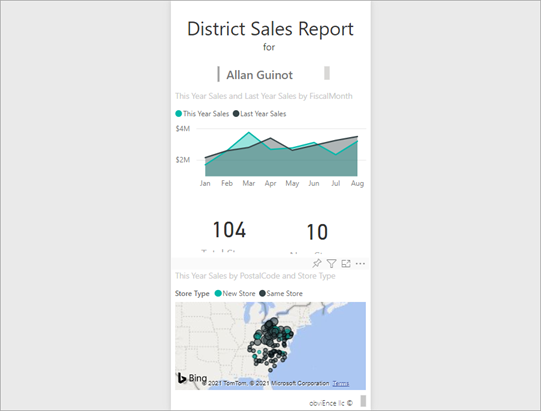 If you're using Power BI mobile, full screen is available for Windows 10 mobile apps. Focus mode lets you expand (pop out) a visual or tile to see more detail. Maybe you have a dashboard or report that is a little crowded and you want to zoom in on only one visual. This is a perfect use of focus mode. 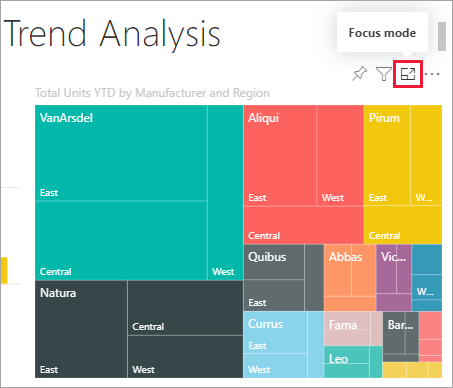 While in focus mode, a Power BI consumer can interact with any filters that were applied when this visual was created. 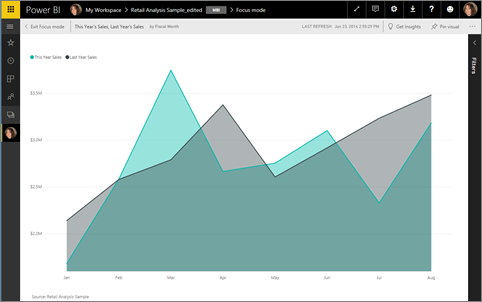 In Power BI service, you can use focus mode on a dashboard tile or report visual. To open either a dashboard or report page in full screen mode, select the full screen icon from the top navigation bar. Once you're in full screen mode, moving your mouse or cursor reveals a contextual menu. Because full screen is available for such a wide variety of content, the options in the contextual menu are each a little different but fairly self-explanatory. Simply hover over an icon for a definition. Use the Back button to navigate to the previous page in your browser. If the previous page was a Power BI page, it too will display in full screen mode. Full screen mode will persist until you exit out. Use this button to print your dashboard or report page in full screen mode. Use the Fit to screen button to display your dashboard at the largest size possible without resorting to scrollbars. Sometimes you don't care about scrollbars, but want the dashboard to fill the entire width of the available space. Select the Fit to width button. In full screen reports, use these arrows to move between the pages in the report. To exit full screen mode, select the Exit full screen icon. There are two ways to open focus mode; one way for dashboard tiles and another way for report visualizations. 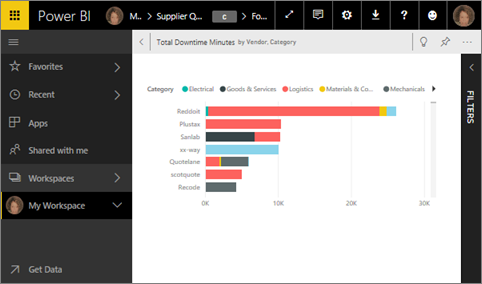 Open a dashboard in Power BI service. 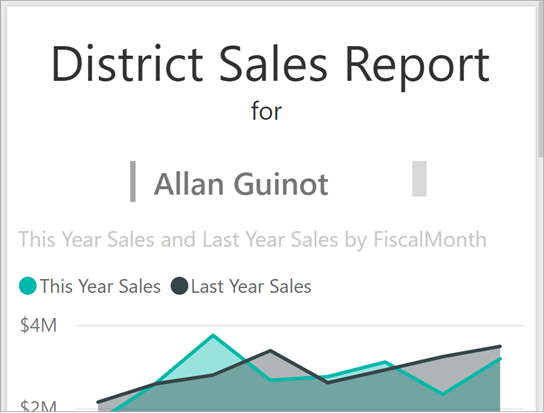 Hover over a dashboard tile or report visualization, select the ellipsis (...) and choose Open in focus mode. The tile opens and fills the entire report canvas. Expand the Filters pane to see all filters applied to this visual. Explore further by modifying the filters and looking for interesting discoveries in your data. Leave focus mode and return to the dashboard by selecting Exit focus mode (in the upper left corner of the visual). 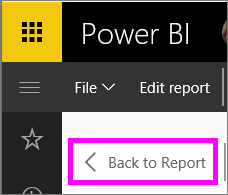 Open a report in Power BI service. In this example, we'll demonstrate using the Retail Analysis sample. After the report opens, select the District Monthly Sales tab. Hover over the area chart in the bottom left corner and select the focus mode icon . The visualization opens and fills the entire canvas. Optionally, expand the Filters pane to interact with the filters applied to this visual. Dig into the data looking for new insights and answers to questions. As a consumer, you can't add new filters, change the fields being used in the visualizations, or create new visualizations. 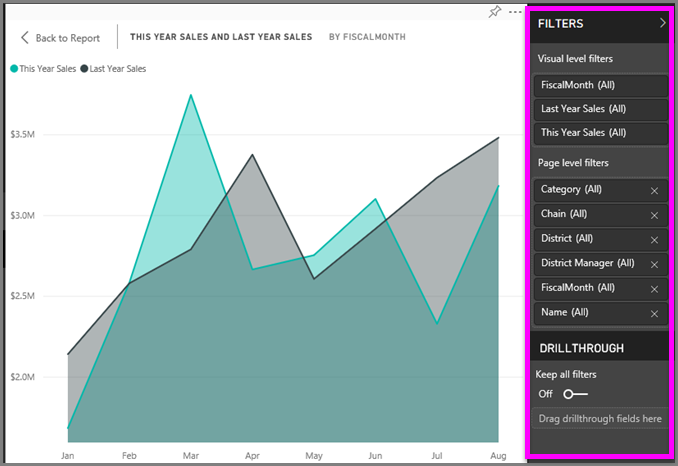 However, any modifications you make to the existing filters are saved when you exit Power BI. If you don't want Power BI to remember your modifications, select Reset to default. Leave focus mode and return to the report by selecting Back to report (in the upper left corner of the visual). When using focus mode with a visualization in a report, you'll be able to view and interact with all filters: Visual level, Page level, Drillthrough, and Report level. When using focus mode with a visualization on a dashboard, you'll be able to view and interact with only the Visual level filter.